Partial shoulder replacement, also called shoulder hemiarthroplasty, is a surgical procedure during which the upper bone in the arm (humerus) is replaced with a prosthetic metal implant, whereas the other half of the shoulder joint (glenoid or socket) is left intact. 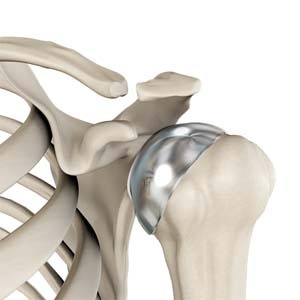 This surgical procedure is indicated in severe, persistent conditions of shoulder osteoarthritis in which only the humeral head or ball of the joint is damaged. Osteoarthritis is a degenerative condition in which the cartilage that allows smooth movement in the joints wears away causing the adjacent bones to rub against each other resulting in pain and stiffness. In such conditions, replacement of the damaged portion of the humerus will reduce the friction as bone ends can no longer come in contact with each other thus ensuring relief from pain. Surgery remains as a sole treatment option when all possible conservative means of treatment such as rest, anti-inflammatory medications, Physiotherapy have been ineffective in resolving your symptoms. While the procedure may relieve your pain and other symptoms, there may also be associated risks and complications as with any major surgery.